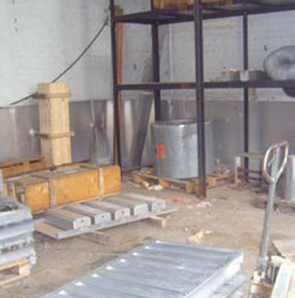 BeWise Waste Solutions Ltd offer a total service package relating to factory closure or relocation. Site clearance of Hazardous materials on behalf of BAE Royal Ordnance, Bridgwater, Somerset. As part of our factory de-comissioning service we are able to relocate and sell redundant plant and equipment on behalf of our clients. Electrical Isolation and Disconnection. Our trained teams are also able to undertake Electrical Isolation and Disconnection of high voltage switchgear and transformers. BeWise Waste Solutions Ltd is competent to carry out the removal of underground and above ground tanks. All works are carried out in strict accordance with applicable legislation, and through the procedures contained within our environmental management system: clear and accurate audit trials are generated to confirm such. Even if BeWise Waste Solutions Ltd do not carry out demolition and de-commission works that may be required, it may be prudent to allow us or a similarly competent company to approve method statements and oversee the works. This will ensure the risk of new contamination is minimised and that unusual occurrences or finds can be dealt with speedily and correctly.